The Hundred Board is a fun and educational exercise found in the Montessori classroom to help children with their counting from 101 to 200. The board and number tiles in the app are exact replicas of the classic classroom materials. The basic task is to transfer the scrambled number tiles on the right hand side to the board in the correct order. 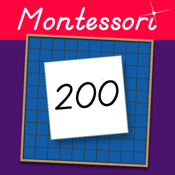 - Assemble the Hundred Board in sequence using either a touch only method where the number tile moves to the board automatically, or drag and place the tiles to the board for them to snap into position. - Show the control numbers on the board to simplify the task. - Simplify the task even further with an activity that shows a reduced number of scrambled tiles to search through. - Assemble the Hundred Board in a random fashion. - Assemble the Hundred Board in sequence by Evens or Odds. - Every number can be heard aloud when it is placed into position, reinforcing the name of each number for the child. - At the bottom of the screen there is either a score or a timer for parents and teachers to evaluate a child's progress. The Hundred Board is now promoted by the Australian Institute for Teaching and School Leadership as an effective app for learning number sequencing techniques. This activity is a time-tested, teaching tool used in the Montessori classroom that children enjoy doing. The app was co-developed and approved by an AMI certified Montessori teacher with over forty years experience. Thank your for your support of our Montessori apps!